I made my first vegetarian meal in the slow cooker this week! See? Look at all those vegetables. I feel healthier already just looking at them. Usually, I might think vegetable soup is………BORING. As in, really boring! Who wants to eat a bowl of mushy overcooked vegetables, anyway? Not this girl. Buuuuuut…..then one of my yoga friends (hi, ondrejka!) 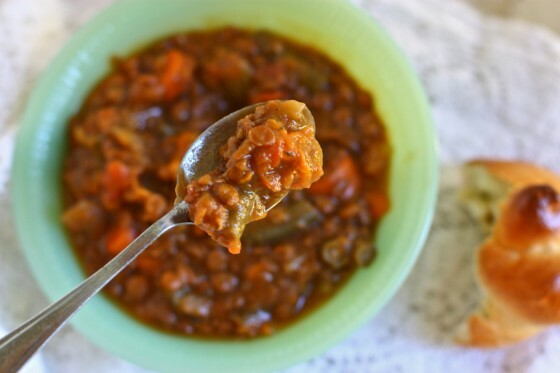 told me about this easy crock pot lentil soup that was a family favorite in her house. And then suddenly lentil soup sounded extra delicious to me and I couldn’t stop thinking about it until I actually made it for myself on Monday. Sweet potatoes, carrots, celery, onions, green beans and lentils are all cooked together for a whopping 10 hours until everything turns to heavenly mush. I know “mush” doesn’t necessarily sound too appetizing, but I promise it’s some of the best mush you’ll ever eat. There’s just no other way to describe it. oh, and those delicious buttery crusty knots? We’ll get to THOSE tomorrow. 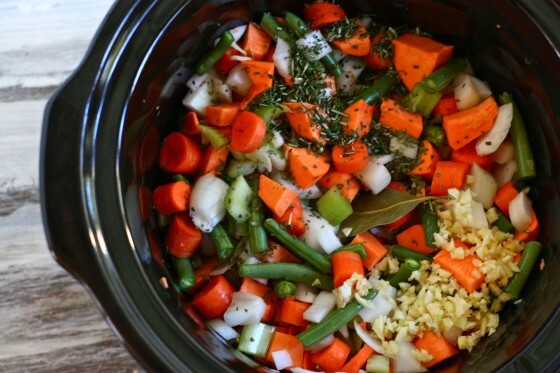 Combine all ingredients in a slow cooker. Turn heat on low and cook for 10 hours, adding a little more broth at the end if soup seems too thick. I spy garlic taking up a nice amount of real estate in that crock pot (I just carefully spelled that)-I’m sold! I desperately want a slow cooker and I think this might be the final push I need. I also massively respect your ability to make lentil soup look appetising. One thing I need to get over is the habit of dumping an entire bottle of hot sauce in ANY soup I cook! I’m totally addicted but I think it might be rendering my assessment of the flavour less valid…. The blog world is filled with mush lovers..ie oatmeal! I am sure this recipe will go down a treat, it has with me at least! I made a pumpkin lentil soup last year and will definitely try the sweet potato version this year. Do you soak your lentils first? I cook with lentils all the time. They don’t need to be soaked first. “Best mush you’ll ever eat!” Ha! I never think to add lentils to anything…. This sounds like a very comforting soup. I love the addition of rosemary. Time to buy a crock pot! I bet…your house…smelled AMAZING!! That looks so delicious, and very hearty/meaty for those who shy away from vegetarian dishes. Yum! Sounds so delicious and filling! Carrots, onions, and celery are always soup staples for me. I’ve been sick for almost a week now, but I might try making some of this to aid my recovery! I’ve never been a fan of cooking vegetables in the crockpot because they do become too “mushy”. But I guess it’s like a pureed soup? It does look good. Could I just adjust some of the ingredients for a smaller crockpot? What size did you use – 6 qt? Yay for vegetarian crock pot recipes! I just got my first Crockpot, and I bought a cookbook to help me figure out what to do with it. There’s only so many pork butts I’m gonna put in this thing, so it’s high time I started filling it with healthy goodies like lentils and carrots. Thanks Jenna! Looks great, Jenna. I love your green bowl, too. So pretty. And Set it and Forget it…sounds like a plan. This looks so good. I can almost taste it. Might I skip breakie and jump right to a bowl of this instead?! what a perfect dinner to come home to! I love the lentil and sp combo! Must remember to buy lentils this weekend! Love the addition of green beans. Looks delicious…and healthy! This recipe just went into my “dinner next week” folder on my computer. 🙂 Thank you!!! And once again I’m left thinking one thing and one thing only: I NEED A CROCKPOT!! I would have never thought to add sweet potato!! YUM!! Gah, this recipe is JUST what I’ve been searching for!!! I just got a crockpot, and have been dying to find a yummy soup recipe to use it for. Do you have suggestions for subbing something other than lentils, though, if I’m not a big fan of those guys? This looks delicious and hearty for the cold months ahead! I have a ton of lentils that I didn’t know what to do with. I will be making this, stat! Thanks for sharing! Oh, how I love my crock pot. I think I’ve use it for the past 4 or 5 meals at my house! I actually like to get a couple of meals ready, pre-cooked with veggies and spices – no broth or liquid, and throw them in Zip-Lock bags. They day I’m ready to cook them I just let it thaw while I’m getting ready for work and TA-DA! Easiest meals ever!! 🙂 Not sure if this one will work out as well, but I’m definitely putting it on my to-make list! I had the most amazing meal at a restaurant last night and for some reason I kept thinking “jenna would LOVE this.” [ i think maybe i read (drool over) your blog too much]. I have no idea if you really would – but it was Spaghetti Squash Carbonara with Bacon & Truffle Oil, with a Poached Egg, and it was to.die.for. Can’t wait to try it out- Sweet potatoes and lentils? What a perfect combo! I’ve been meaning to pull out the slow cooker for a while now, but didn’t want to just toss in a roast and potatoes. The cooking time is perfect too – It is always hard to work in a stop at home during the work day when something is supposed to be in the pot for less than 10 hours. Are the lentils pre-cooked or is that 2 cups of dry lentils? What if you use canned lentils? You think this really needs 10 hours or would suffice? I have everything on hand and would love to throw this together for dinner tonight but 10 hours from now is 8:30 and that’s like 1.5 hours past my stomach rebelling at me for not feeding it! You could do 8 1/2 hours, I’m sure!!! The soup just gets really, really, really thick around 9-10 hours but if I were you and had all the stuff on hand, I would make it and eat it after 8! 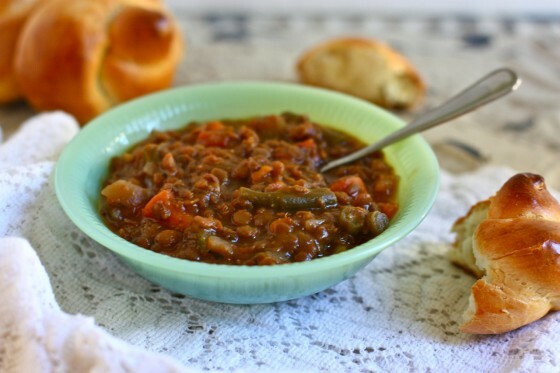 Mmmm, I looove lentil soup – so hearty and filling and flavorful all at the same time! Crockpot is a great idea! 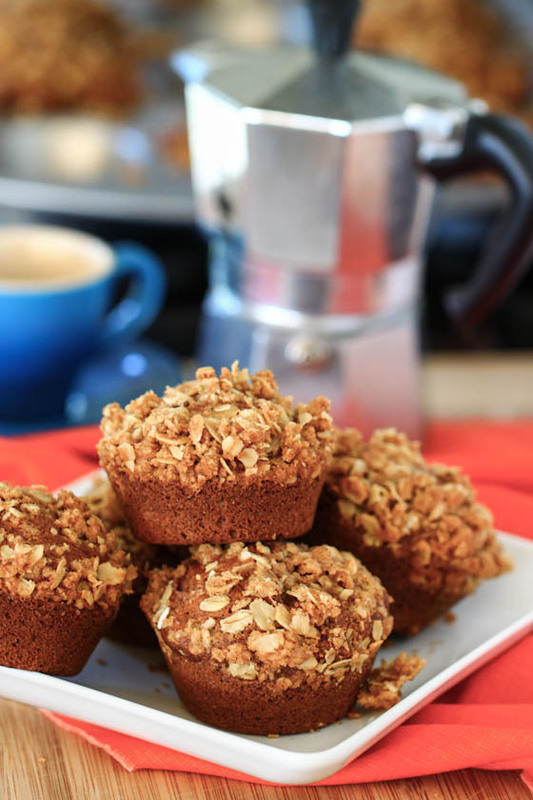 This looks super easy … except for waiting … and LOVE these ingredients! Can’t wait to try this one out. I’m scared to work with lentils for some reason, but this looks like the best ice breaker! Will be making this very soon! Never put sweet potatoes in soup before, but it sounds amazing! yum! this soup looks delicious, but those knots are in the forefront of my mind! can’t wait to share them tomorrow—they were AMAZING! I love how easy this sounds and the idea of the sweet potatoes all happy and sweet in there sounds divine! This sounds awesome! I love how healthy it is! I actually really love lentil soup. It’s hearty, warm, and reminds me of my childhood. I need a crock pot in my life. Pronto. This soup/stew looks so deliciously comforting. Crock pot recipes are the best. Nice! I’ve been experimenting with lentils lately, too – my most recent success was Curried Lentil and Root Vegetable Stew. I didn’t use a crock-pot, but I imagine you COULD, if you chose. This “mush” looks phenomenal. Lentils are one of my favorite things. Mmm! Wait….have you been clicking my tweets??? I’ve been looking for a lentil soup slow cooker recipe for the last two weeks! I am excited to try this over the weekend. Sorry if this is a silly question, but do you just add dried lentils into the soup or cook them prior? I’ve yet to use my crock pot OR make a lentil soup, which have both been on my cooking to do list for a while. Looks like I might be able to cross both off very soon! You do want to use green lentils rather than red lentils because they cook totally differently. Red lentils will give straight mush! Just made this today– it is AMAZING!! I’m loving every bite and it’s just in time for cold weather! Thanks for the recipe! I made it on Friday and it is super DELISH!! Even the boy who claims to absolutely hate veggie soup thought it was good! In the freezer to pull out for those cold winter nights! Yum this looks so tasty and comforting! Would red lentils work just as well? I am very partial to red lentils but I know they cook faster than the green ones. I think I need to half this next time… I just combined all the ingredients in a 6 qt and the crock pot is filled to the tippy top! 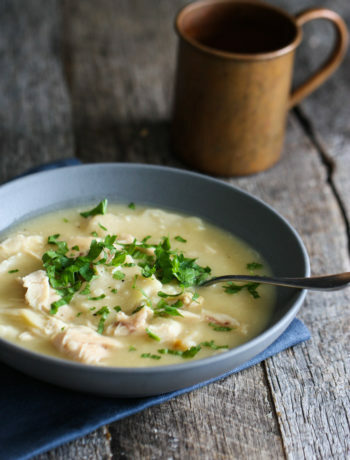 Can’t wait to try it tonight, I’ve been thinking about this soup since you posted! Mine was filled to the very tippy top too—don’t worry—it cooks down!!! Thanks for asking this. Looking at the ingredients, I was thinking this was sure to overflow my crockpot. You confirmed it- mine is 3 or 4 quarts! I’ll be sure to halve the recipe. I did half this recipe because I made it just for lil’ ol me and it was posititvely delicious. Just had it for lunch again! And I left out the tomatoes b/c I did not have any. Thanks for all the wonderful recipes!!! Hi Jenna 🙂 This sounds amazing and I am making it tomorrow! Question, I know you say 10 hrs is best, but curious if you split and did part of the time on HIGH and then part on LOW what would you suggest??? Thanks! If you split it up, I would probably cook it on high for 2 hours and then on low for 5? I haven’t tried that but I’m sure it would work! Hi again 🙂 ok so I am starting to think I need to transfer the whole thing to a large stock pot and simmer on the stove! It is ridiculously full, LOL! like the lid is sitting on liquid! Suggestions?? hm. Mine was very full too but it really does cook down!!! If you think it’s really too full, I would just ladle out a cup of the liquid but keep it in the slow cooker. It will cook down—promise! Thanks Jenna, I will probably just leave it in for now and watch it. It is so full I can’t even stir it! Hopefully it cooks down and can be stirred in a bit. If I try and stir it will probably spill over! Cant wait to try this. Love soups and I love my crock pot. Perfect combo. making this right now with butternut squash instead of sweet potato, YUM! thanks for the recipe. i don’t have a crock pot so I just made this on the stove for lunch and it was really good! thanks! 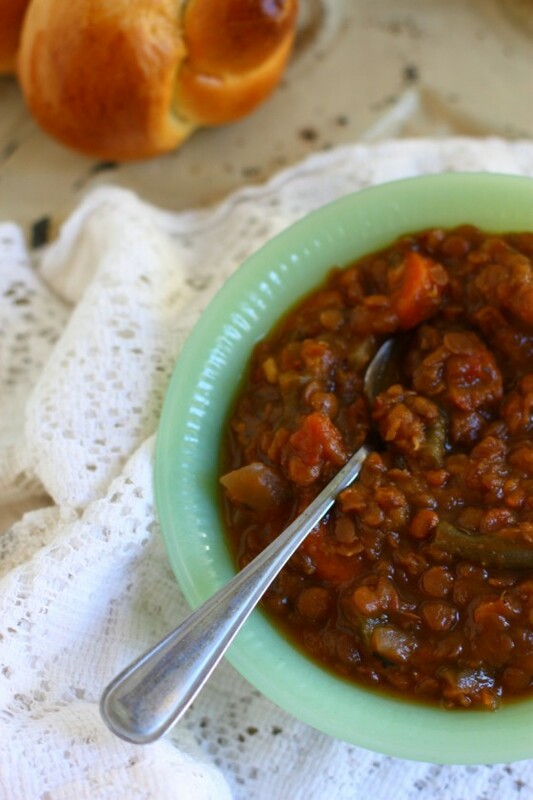 Do you know if this sweet potato lentil soup freezes well? It does! Just freeze then defrost in the fridge overnight before heating. Wow, I just made this today and what a yummy dinner it made! I was fresh out of celery so subbed some green cabbage for it. I didn’t start it till after lunch and didn’t want to wait till the fourth of July for it to be done so I cooked it on high all afternoon till about 6 pm and it came out mushy and perfect. I left out the salt though and used no/low salt ingredients and it was rather bland, so I doctored it up with a ton of cumin and that did the trick nicely. I froze 4 of the 5 quarts it made for fast future meals. Thank you for sharing such a great recipe! Just wanted to say I made this with a few adaptations on the stovetop and it was great! I was hesitant as I’m not a big lentil fan, but this was the best mush ever! I printed this recipe this past weekend, and bought all the ingredients. My husband chopped all the veggies, and put it in the crockpot last night. I just brought some for lunch at work, and it was so tasty! Lots of flavored and full of veggies! I love anything with sweet potatoes in it! Thank you for the recipe. I made this for dinner yesterday and i have to say the best lentil soup i have ever ate! YUM!! This sounds good. Do you think it can be prepped at night and dumped into the slow cooker in the morning before work? When I make this, I make the whole thing at night. 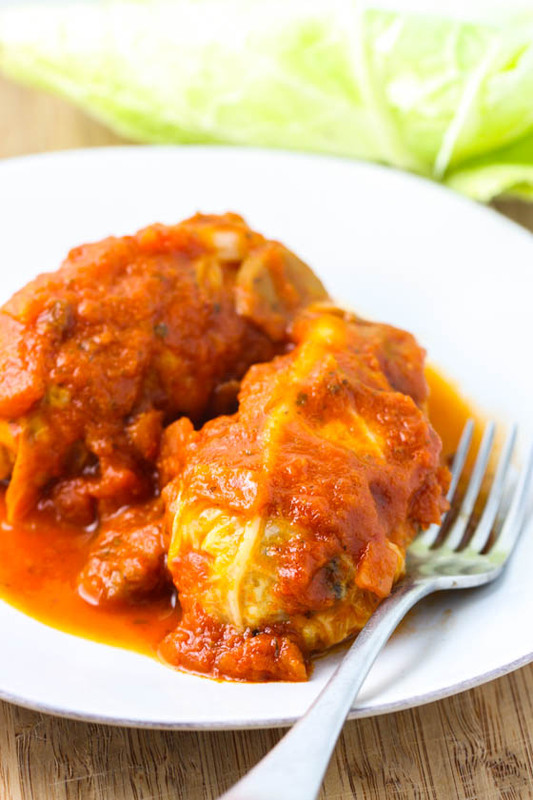 I dump everything in the slow cooker around 10pm before bed and let it cook all night — it’s so much easier and faster! I was so excited about this, but it turned out to be really, really bland. And it wasn’t really mushy either. Maybe I added too much liquid, although I followed the recipe. Disappointed, because I love lentils and sweet potatoes! I’m going to try leaving it in the crock pot longer to see if it will “mush” down more. Do you have the calorie/nutrition info for this recipe? Looks fantastic– can’t wait to try it out on the crock pot I just bought! I cooked this for 10 hours and it’s still not mushy yet ): this is my first experiment with a crockpot. Will it work if I leave it in longer? Im and avid crockpot user as a single dad of 3. It saves me heaps of time! 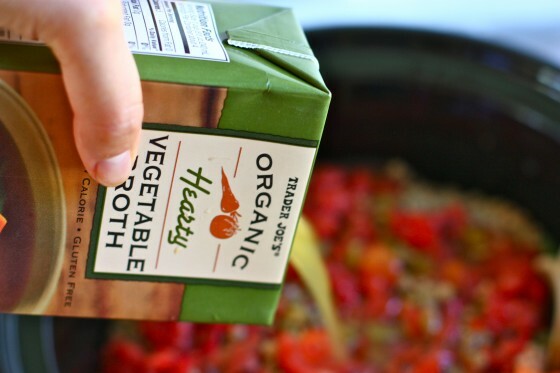 Im going to use this recipe ASAP and I’m always on the look out for healthy crockpot meals. Im not a fan of veggie inclusive meals, I LOVE BIG PROTEIN. lol. How would I go about adding lean chicken into the mix? I was thinking about throwing some chicken breasts in the pot. Suggestions? Great! You can substitute chicken breasts for the thighs, no problem. The stew make take a little less time to cook but you can still shred the breasts (just like you would the thighs). looks delicious Thank you so much ! I made this yesterday for dinner. My husband and I have both been under the weather, and this was the perfect thing! The flavor was delicious! Thanks for posting! Made this for my Lebanese fiance w/o the sweet potatoes and he absolutely loved it! So easy. No adjustments were necessary to omit the sweet potatoes. Thanks for a great recipe! Vegan Fast: Week Five | Ponyboy's Two Cents!! This was one of the best soups I have ever made. So hearty and it had great flavor! Hi there, can you tell me if you used a 6 quart crock pot? Looks divine, but I’m a little concerned my pot is too small. Thank you! It’s a little too big for my 3qt pot. I hope it doesn’t overfill because it’s full to the brim without 3 cups of the broth added and I left out the green beans (didn’t have any on hand). Wow, this is a large recipe… I got out my bigger crockpot and I can’t add the last 3 cups of broth. I think it’s a 3 quart… I hope the veggies cook down as the lentils expand because it is full to the brim right now. I love this recipe! I’ve been making it regularly for several years. Thanks, Jenna!! Can this recipe be successfully halved? I do not have and do not want to invest in a crock pot large enough for whole recipe but really want to try this. Also, my cooker has a high and low setting–am I guessing correctly that a cooking time this long would take the low setting?